I suddenly realised it was time to do something different from what I had planned for this summer. It was time to go north. It was time to go into a great wilderness with no roads, trails or people. Into a great boreal forest filled with things most people would not care for. Like muskeg and mosquitoes and rivers and "valleys unpeopled and still". O God! how I’m stuck on it all"
Overlooking the Ross River in 2011 after wet and sweaty slog through thick brush, the sky finally showing some blue, after days of rain. 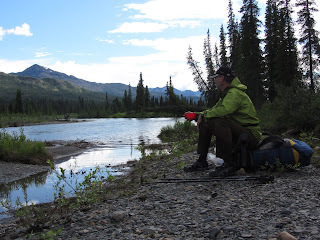 Some years ago I hiked from the Yukon, across the border to Canada's Northwest Territories, into the headwaters of the South Nahanni River and packrafted that great waterway for 600 kilometers. You can read about it here. While putting the finishing touches to the new edition of my book Vandra Fjäderlätt I suddenly realized it was time to go back. Not to the river, but to the bushwhacking slog through an unpeopled land, where few people would (be stupid enough to) walk. I do not know if I am crazier than most people, probably, but that always depends on where you stand yourself. Those backpackers who have stepped off the man made trail and headed out into a land where you have to choose your own route, ford the rivers where you can and experience the vertiginous feeling of knowing that there is no one, and nothing, for not only miles, not only tens of miles but maybe for hundreds of miles in any direction, they know what I am talking about. At the end of my packrafting trip down the South Nahanni I came to the native village of Nahanni Butte. Flying out I took some photos of the vast area to the north. This area has some interesting formations, located in the middle of nowhere; the Nahanni Karst and the Ram Plateau. 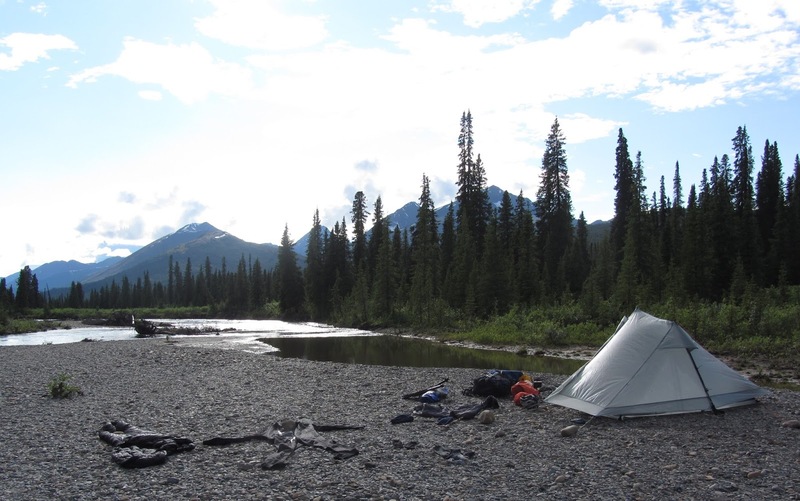 This area has been described as "an area of mountains, plateaus, deep canyons, boreal forest and alpine tundra. This is home to Dall's sheep, mountain goats, woodland caribou, moose, black bears, grizzly bears and wolves. Wolverine, weasels, martens and snowshoe hares are also native to the area. Terns, falcons, bald eagles, golden eagles and the endangered trumpeter swan nest in the protected hills and lakes. The Nahanni Karst and the Ram Plateau are considered to be globally significant areas." The houses to the lefe is Nahanni Butte, the river is the South Nahanni. To reach the Ram Plateau is pretty easy, you let someone ferry you across the river a bit upstream, past the promontory on the right bank. Then you walk for a 100 kilometers. Few people visit the Ram Plateau and most of them fly in with a helicopter from Fort Simpson. To me, flying into place like that would diminish my experience. I want to relish the experience of getting closer and closer, fueled by my own sweat. Alone with my own thoughts. It was for that very reason I had chosen to hike in to the headwaters of the South Nahanni, instead of going in with a floatplane. To each his own. It is time to go for a walk.